Vrabel, Beth. Bringing Me Back. Noah's mother is arrested for drunk driving after a middle school football party, which has myriad consequences: she is arrested and sent to prison for several months, her boyfriend is made Noah's guardian, Noah reacts poorly and is caught shoplifting, and the school football team loses its coach and is disbanded because of lack of funds and the bad publicity. The loss of the team is difficult for the impoverished West Virginia town, and Noah is ostracized and ill treated by his classmates. When the former cheerleaders start a fundraising campaign to reinstate the team (which involves nominated students pouring expensive energy drinks over their heads-- not exactly cost effective! ), things do not improve for Noah. One bright spot is Rina, who is bound and determined to start a school newspaper even if the administration is less than thrilled with her attempts. When a bear is spotted near the school with a bucket stuck to its head, Noah fixates on getting the bear help, and Rina takes advantage of his fixation to convince him to work on the paper with her. Another bright spot is Jeff, his guardian, who is struggling to do the right thing by Noah and steadfastly sticks by him. Noah also must deal with former football playing friends who have turned on him, not wanting to talk to his mother, and managing to get through his schoolwork while dealing with everything else on his plate. Noah and Rina manage to get more attention focused on the bear, and this activity helps Noah make peace with other things in his life. Strengths: There's definitely a boatload of sad here, BUT the tone is generally upbeat and hopeful. This makes all the difference. The depiction of bullying is the most realistic and understandable that I have seen, and Jeff is a phenomenal character. His back story actually made me cry. The Appalachian setting, the struggles of an impoverished community are well done, and the intricacies of dealing with an incarcerated parent are portrayed in a no-nonsense but hopeful and productive way. Vrabel's writing gets better with every book. Very impressed with this. Weaknesses: I wished I had seen Rina's mother! Rina is just a hair shy of being too over the top, but her support of Noah makes up for it. What I really think: Definitely purchasing. This will take a little bit of book talking, since the cover doesn't give away much, but that could also work to its advantage. While WWI used planes, the technology and use really took off during WWII. It's hard for people today to understand how all-consuming this war was, but Pearson does a fantastic job at setting the scene. Factories of all sorts switched from their regular products to producing for the war effort. Some Kellogg's plants quite making cereal, for example, and produced K rations. Cars and car parts were not produced, families were encouraged to put in gardens, which many did since different types of food were rationed. So many men went to war that women had to step into jobs of all types that had previously been closed to them. It is not surprising, then, that women were grudgingly welcome to noncombat flying jobs. Civilian flying took off in the 1920s and 30s despite the Great Depression (even my uncles got together and bought a prop plane that they would land in the fields near their dairy), and women who knew how to fly saw the Women's Airforce Service Pilots (WASP) program and others as a way to do something for their country using their skills. There were people and bases who were supportive and appreciative of these efforts, and those who were not, but stepping into a traditionally man's job had many challenges. There were no appropriate uniforms for the women, and they came up against a lot of prejudice and harassment. The final blow was the fact that the militarization of the programs was voted down, and the women involved didn't get full military honors and benefits for many years. 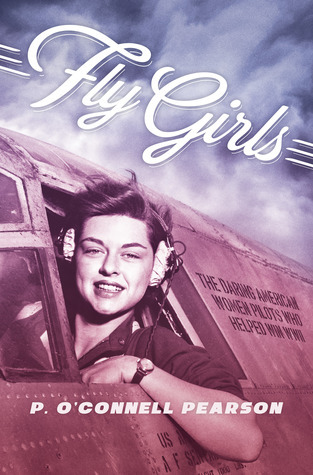 Fly Girls is a great book about World War II. It's a topic that a handful of readers investigate avidly, and I am pleased any time I can find a book on a tangent that hasn't been well covered. Pearson does an excellent job of delineating the general atmosphere both on the home front as well as the fighting front. In addition, the details about the tenacity with which women went after jobs that were not easy for them to get are inspiring. I have read quite a bit about both WWII and women's history, and even I did not know about the magazine articles at the time that downplayed the dangers the women faced and made the articles all about nail polish and well-coifed hair! The bibliography is extensive, and I appreciated the footnotes: all too many middle grade nonfiction books are a bit slapdash when citing sources, which makes it hard to encourage students to do it correctly! Along with Colman's Rosie the Riveter: Women Working on the Home Front in World War II (1998), Mary Cronk Farrel's Pure Grit:How American World War II Nurses Survived Battle and Prison Camp in the Pacific (2014), Cheryl Mullenbach's Double victory : how African American women broke race and gender barriers to help win World War II (2013), this is an essential purchase for all middle school and high school libraries and is an excellent nonfiction companion to Smith's Flygirl and Davis' Mare's War. Now I really want several more middle grade novels about the brave women who flew during WWII. Looked like a bear story to me—maybe an update on Gentle Ben. Thanks for the background and your thoughts to clear up the cover confusion. Sounds like a powerful story. Great reviews, Karen. I have Fly Girls on my list, but the other is new to me, sounds sad but good. Students need to know that others do "live" sad stories, and need support. 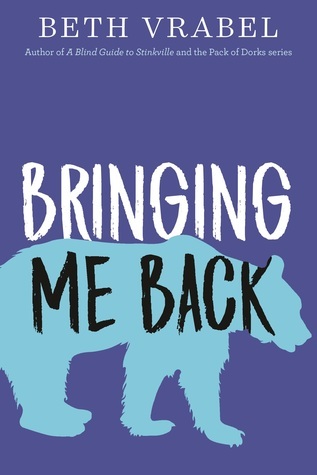 Bringing Me Back sounds very interesting. It doesn't seem like the cover does this book justice. Thanks for the heads up about Fly Girls. Last Fall I read The All-Girl Filling Station's Last Reunion by Fannie Flagg and have been interested in reading more about the Fly Girls ever since. I enjoyed Beth Vrabel's Caleb and Kit. She really delves into her characters. Will definitely read this book. Thanks for the heads up on the new release. I love books about every angle of WW II, so Fly Girls will go on my list. My mother was a young woman during that time period. Women took on so many different roles. Thank you for sharing!